Scientists at the Department of Energy's SLAC National Accelerator Laboratory and Stanford University have discovered a potential way to make graphene – a single layer of carbon atoms with great promise for future electronics – superconducting, a state in which it would carry electricity with 100 percent efficiency. "Our work points to a pathway to make graphene superconducting – something the scientific community has dreamed about for a long time, but failed to achieve," said Shuolong Yang, a graduate student at the Stanford Institute of Materials and Energy Sciences (SIMES) who led the research at SLAC's Stanford Synchrotron Radiation Lightsource (SSRL). 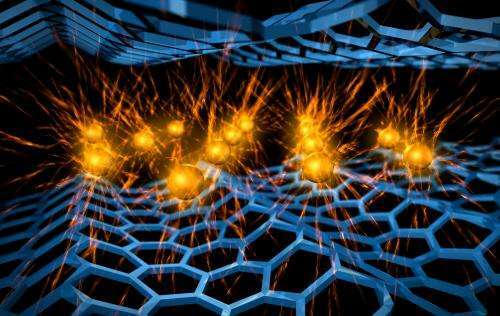 The researchers saw how electrons scatter back and forth between graphene and calcium, interact with natural vibrations in the material's atomic structure and pair up to conduct electricity without resistance. They reported their findings March 20 in Nature Communications. The classic way to make graphene is by peeling atomically thin sheets from a block of graphite, a form of pure carbon that's familiar as the lead in pencils. But scientists can also isolate these carbon sheets by chemically interweaving graphite with crystals of pure calcium. The result, known as calcium intercalated graphite or CaC6, consists of alternating one-atom-thick layers of graphene and calcium. The discovery that CaC6 is superconducting set off a wave of excitement: Did this mean graphene could add superconductivity to its list of accomplishments? But in nearly a decade of trying, researchers were unable to tell whether CaC6's superconductivity came from the calcium layer, the graphene layer or both. "These are extremely difficult experiments," said Patrick Kirchmann, a staff scientist at SLAC and SIMES. But the purity of the sample combined with the high quality of the ultraviolet light beam allowed them to see deep into the material and distinguish what the electrons in each layer were doing, he said, revealing details of their behavior that had not been seen before. "With this technique, we can show for the first time how the electrons living on the graphene planes actually superconduct," said SIMES graduate student Jonathan Sobota, who carried out the experiments with Yang. "The calcium layer also makes crucial contributions. Finally we think we understand the superconducting mechanism in this material." Some better understanding, some hope, but no real increase of the critical temperature toward the room temperature. The doping of graphene with alkali metals is already known with increasing of critical temperature of graphene by few Kelvins above zero temperature, but the resulting products are very sensitive to air (pyrophoric actually). The physicists should attempt to reproduce this finding instead. Its the boundary effects. Try looking at graphene layered with magnets. The chaotic randomness of the contact points is involved. Try a YBCO and graphene layer on layer for best results!